I can’t think of a more apt way to describe Shadow of the Colossus than the term, “spiritual successor”. It’s not a sequel to Ico – there are no recurring characters, none of the same environments (it could be set in the same world though, I suppose), and any similarities are simply in themes and the overall aesthetic. The initial opening mentions that the strange girl that you must fight to save was sacrificed which could be seen as thematically similar to leaving the outcast boy in Ico to die, and they share the same ethereal tranquility, but the similarities don’t go far beyond that. The premise of the game is intriguing – a high concept fantasy adventure in which levels, puzzles, and enemies are one and the same. 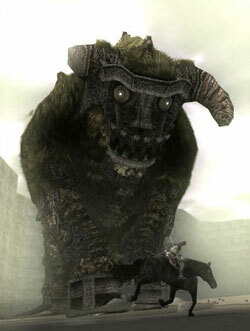 In order to save the girl who you’ve brought to an unexplained temple in the middle of a deserted land you must hunt down and kill the sixteen colossi, giant creatures that aren’t necessarily aggressive but still require you to find a way to climb to their glowing weakpoints and deliver the killing blow. When all sixteen are dead and their effigies destroyed the girl might be revived…but at a price. The story is very much secondary to the process of getting there, with very little exposition between the intro and the last few chapters. It’s the presentation of the game which has the power to really blow you away. This game has to be pushing the PS2 to its absolute limits when you see the size and scale of the world and the colossi, and there is almost no loading beyond the brief initial one when you boot it up which is another impressive achievement when you consider how long you’re left sitting there at a loading screen when you play other seamless games like GTA. However, it often seems to be pushing the PS2 beyond its limits just as much, since the framerate is very inconsistent. Never so bad that it impacts on the gameplay, but I doubt that it even reaches 30fps most of the time. Sound is similarly good with no music outside the boss fights, but when it does come on it creates a suitably epic and tense feel to the boss fights. This is probably going to be a soundtrack that I’ll be buying at the Japanese release. The game isn’t without flaws – the camera can be more of a threat than even the biggest colossus, for example – but this is certainly something that can be described as an experience, and one that you should try. Make it a bigger hit than Ico and give them the rewards that they deserve for their sterling work.